Xin Cheng has been awarded the Sunanda and Santimay Basu Early Career Award in Sun-Earth Systems Science. 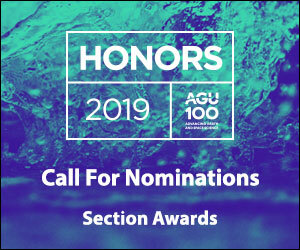 The award recognizes an individual scientist from a developing nation for making outstanding contributions to research in Sun-Earth systems science that further the understanding of both plasma physical processes and their applications for the benefit of society. Cheng’s thesis is entitled “On the origin, structure, and evolution of coronal mass ejections.” He presented an invited talk and was formally presented with the award at the 2013 AGU Fall Meeting, held 9–13 December in San Francisco, Calif.
Xin Cheng received his B.S. in physics from Zhejiang University of Science and Technology, Hangzhou, Zhejiang, China, in 2007. In 2012, he received a Ph.D. in astrophysics from Nanjing University, Nanjing, Jiangsu, China, under the supervision of Mingde Ding and Jie Zhang. Xin is currently working as an assistant research scientist at the School of Astronomy and Space Science, Nanjing University, Nanjing, Jiangsu, China. His research interests include coronal mass ejections and associated solar active phenomena, magnetic structure of active regions, and space weather.